Now...I'm not too sure I understand the whole Flappy Bird thing. I haven't played the game, so while I might be in the dark, for potential employees of one Chinese game company, Flappy Bird knowledge might just be the way into a job. According to China News, an odd online job listing appeared online in China over the weekend. What makes this job listing unusual is that applicants are asked to be able to play Flappy Bird for at least 20 levels before being considered for the job. The opening is for an Android software developer. China News was able to dig up more information about the company, which is named Wuhan Wei Pei Information and Networking. The studio is about a year old and was founded by a group of young game makers. The company's focus is on developing applications for mobile devices, which makes sense because the job opening is for an Android developer. China News quotes a Mr. Tang, who is responsible for the job posting. Tang says that the job posting is unique and has drawn up lots of publicity for the company and adds that the game is a good way to figure out the personalities of an applicant. 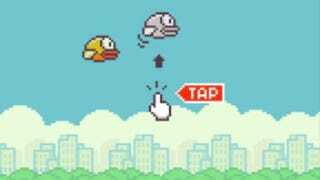 He also says that applicants who turned up and played Flappy Bird were in high spirits. Despite the information provided by China News, Kotaku was unable to find a website for the company. We have, however, found an online posting of the job opening and have requested comment. This story will be updated should we receive a reply and confirmation.